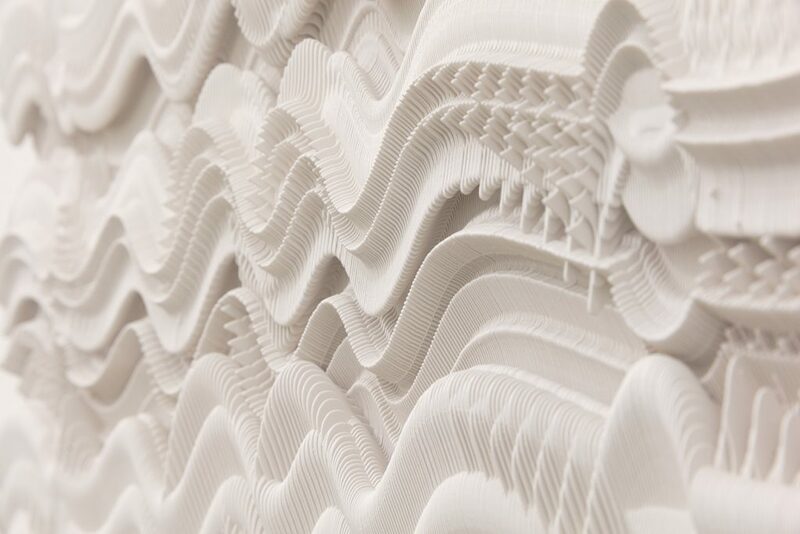 The solo exhibition of the Brazilian-born artist of Jewish and Russian descent, who lives in Rio, presents eighteen “reliefs,” as he designates most of these works. The biggest share on exhibit here was produced in 2017 with the exception of four works spanning from 1993 to 1987. Luiz Camillo Osório, the curator of this exhibition, is a professor in the Department of Philosophy of PUC-Rio, an art critic, the curator of the PIPA Institute and an author with several books to his name. Visually, Palatnik’s art conveys a sound-wave-like musicality based on a technique and system akin to piano tuning, which he originally devised in the 1950s. 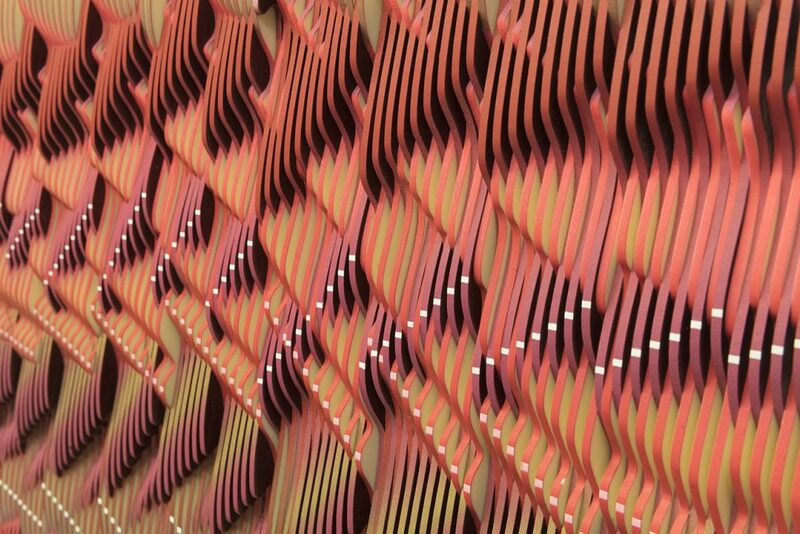 However, in place of musical chords and an interaction among notes, he “fine-tunes” spray-painted laths organized to interplay like optical waves. To obtain this subtle visual sensation he delves in a combination of minute adjustments and displacements guided by the micro-movements of his steady hand, a keen power of observation, an unwavering patience and the appreciation for perfection like a Swiss watchmaker. 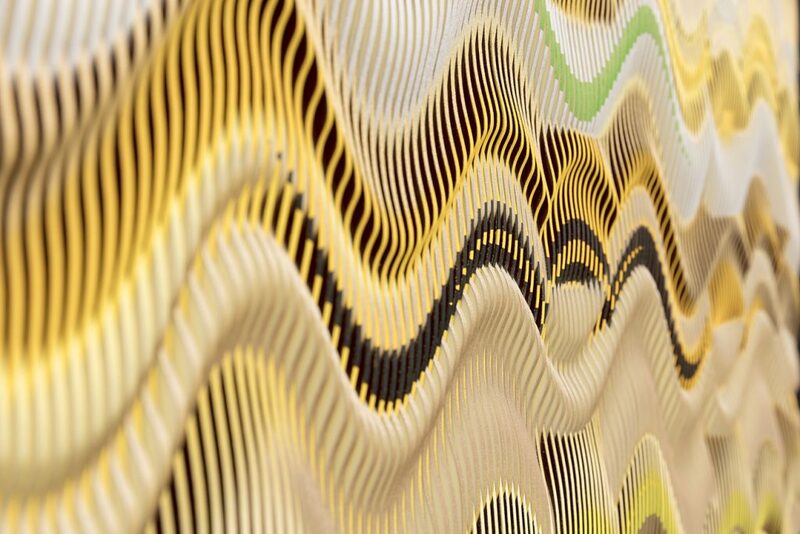 The result are mesmerizing optical reliefs that enthrall both cognoscenti and amateurs, old and young alike. Luiz Camillo, Palatnik will turn ninety in February. You have observed him in his studio in Rio to curate this exhibition; how is his disposition after a sixty-year long trajectory? Abraham Palatnik is a tireless, painstaking inventor. On the verge of turning ninety, he still dedicates himself to his work, day in, day out, with the rigor and persistence of a young artist. 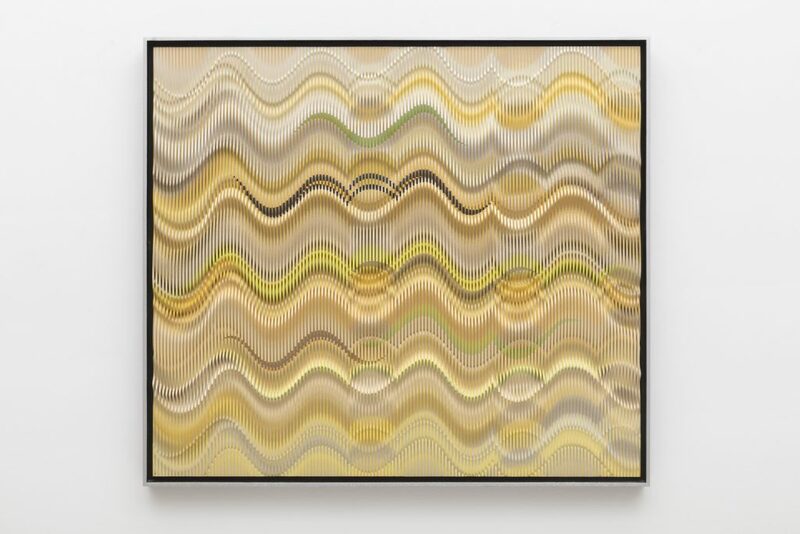 It is fascinating to watch a man his age lean over the large table in his studio in search for minute optical motion resulting from the displacements of colored laths of wood or acrylic shaped in wave-like forms fixed on a wooden board. His hand remains steady and his eye sharp as ever. Since the early 1950s, it is this relation between movement real or virtual, coupled with a rare perceptive attention that moves his poetic artistry. His “Kinechromatic Machine” at the inaugural São Paulo Bienal in 1951 caused a stir among the jury [in those days the event had a jury]. His work was so innovative and unusual they did not know how to classify it as art or science. 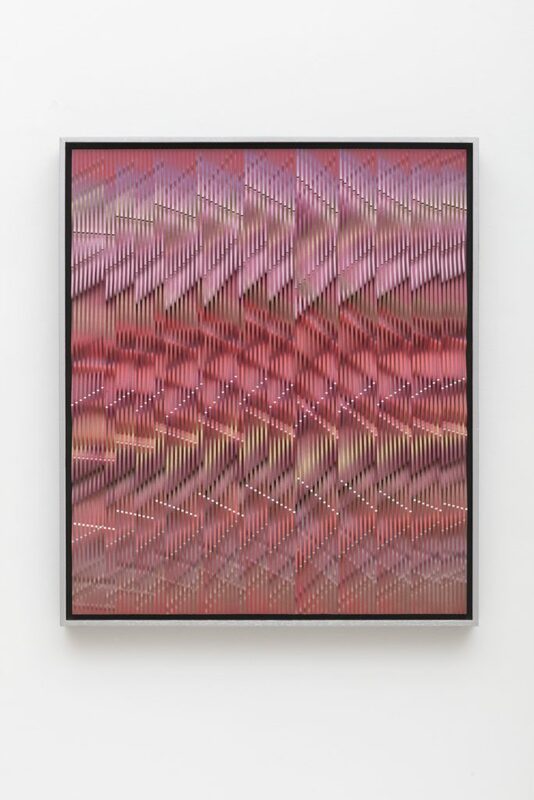 The name, “Kinechromatic Machine” given by art critic Mario Pedrosa, could not be more precise—it anticipated the artist’s pioneering work in the field of luminous kinetics. His “Kinechromatic Machine” introduced movement to art through an ingenious composition of lights programmed to operate in a pre-defined order and rhythm by a small electronic device. Controlled chance determines how the lighting goes on and off creating chromatic effects on the surface of a screen that covers the box where the lamps are installed. At that time, Palatnik hand-colored the lamp bulbs himself, one by one, to achieve the chromatic luminous effect he desired. In a few words, explain what is behind the concept of his experiences in kinetic art. 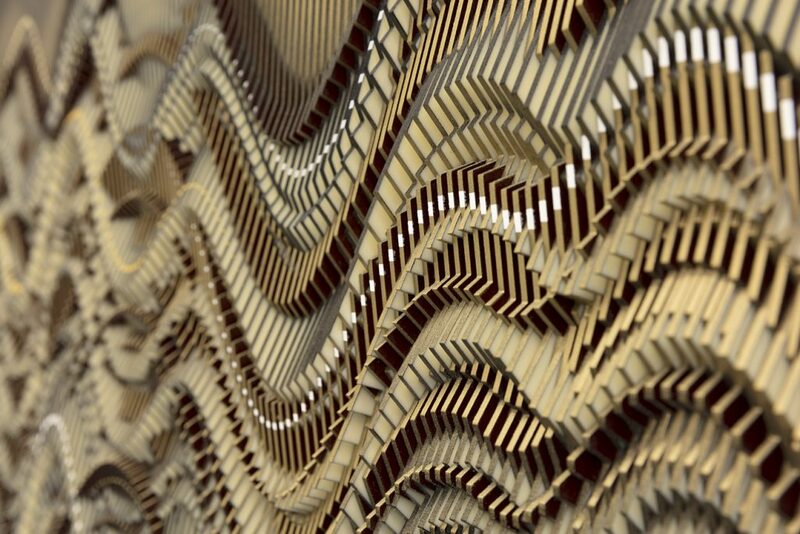 Since the “Kinechromatic Machine,” his research for new materials and the rigor of his method combined with his hallucinatory perception became the main axis of his work. Before that he conducted several experiments, nevertheless it is this curious combination of chance and determination that guides him to this day. In the process, his artisanal skills and attention to details remains the same. The technological dismay and ease in dealing with machines never alienated him from his hands on work. In today’s virtual world this combination is both a lesson in poetic artistry and work ethics. What distinguishes the current exhibition from his previous ones? 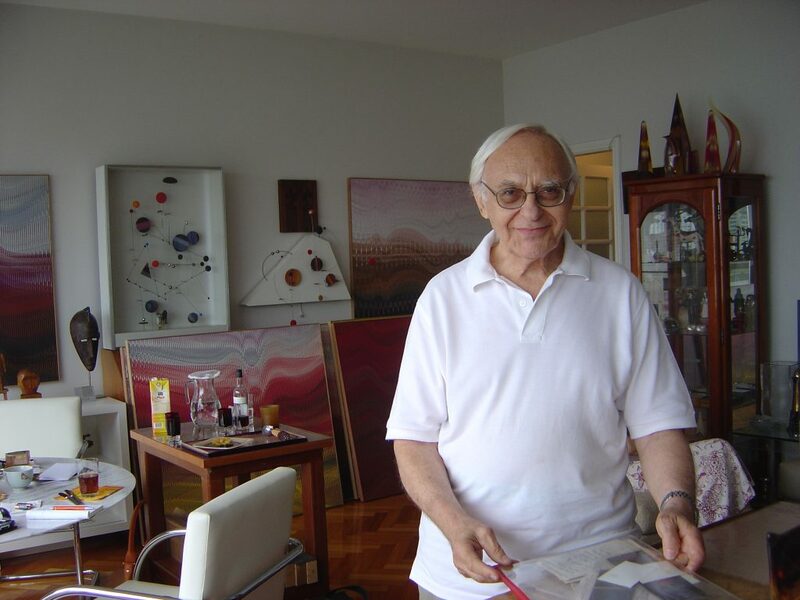 Palatnik’s career amounts to six decades dedicated to the arts since the inaugural São Paulo Bienal yet he remains the same inquisitive man infatuated with constructive rigor. In 2016, he began an investigation with acrylic. There is an interesting genealogy in this new endeavor since the focus of the current exhibition is to reconstruct his life’s work. 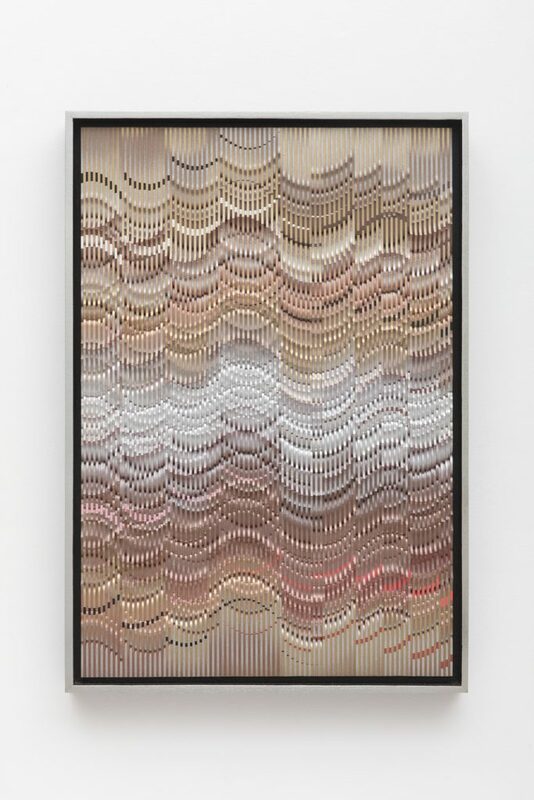 On the one hand, it incorporates the experiences of his “Progressive Reliefs” series with cardboard strips, on the other, it advances his optic-kinetic series with the wood progressions produced in polyester in the 1970s and, more recently, beginning in 2000, executed with colored laths. What is your feeling when you look at a work by Palatnik? 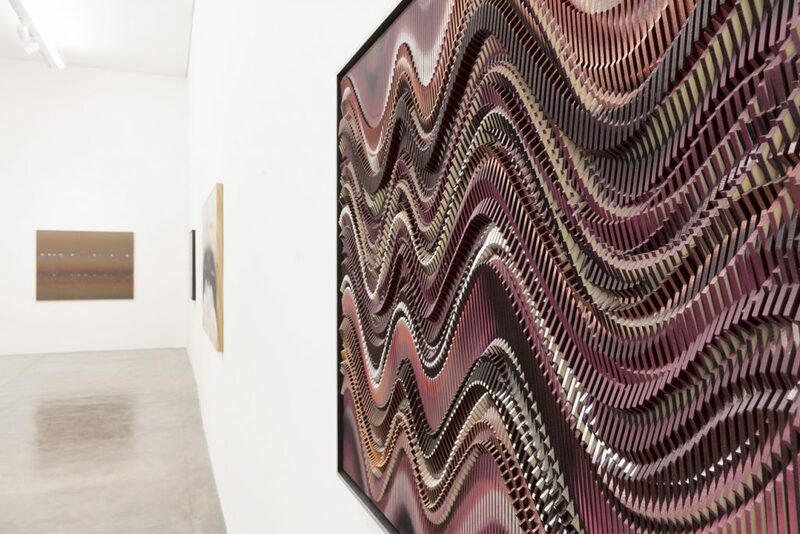 His endless experiences in new processes and materials, as well as his obsessive persistence in researching visual rhythmic compositions, is very particular to Palatnik’s oeuvre. Although his work enjoys a continuous flow it is also moved by unexpected developments forthwith sanctioned by his poetics. The observation of his work is in itself an intellectual exercise aligned with the most authentic aesthetic pleasure—the more I look, the more I am enchanted. 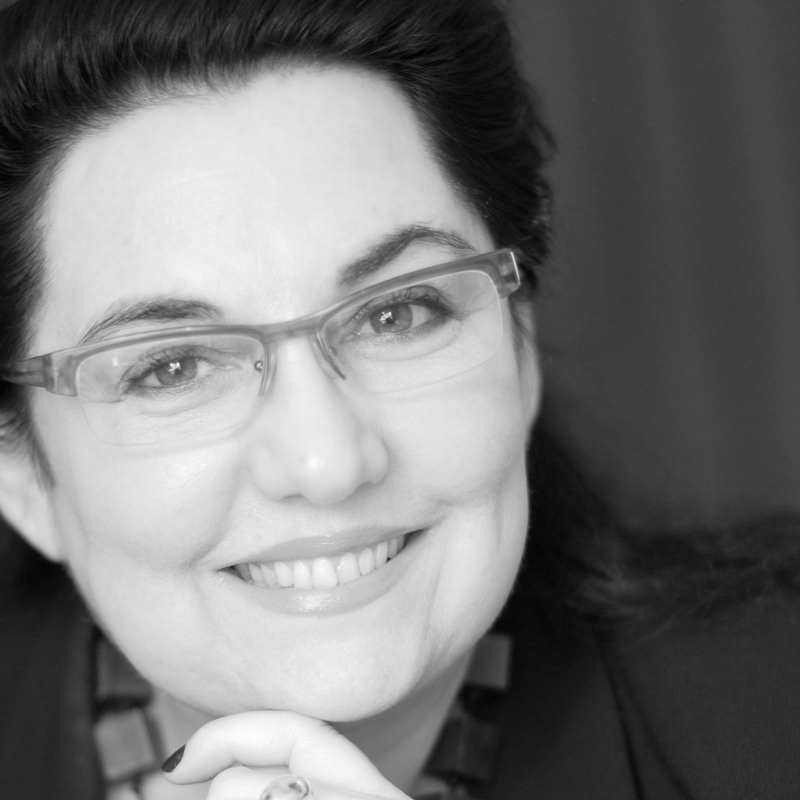 Rio-born Cynthia Garcia is a respected art historian, art critic and journalist fluent in five languages stationed in São Paulo. Her daughter America Cavaliere works in the contemporary art market and her son Pedro Cavaliere, based in LA, is in the international DJ scene.